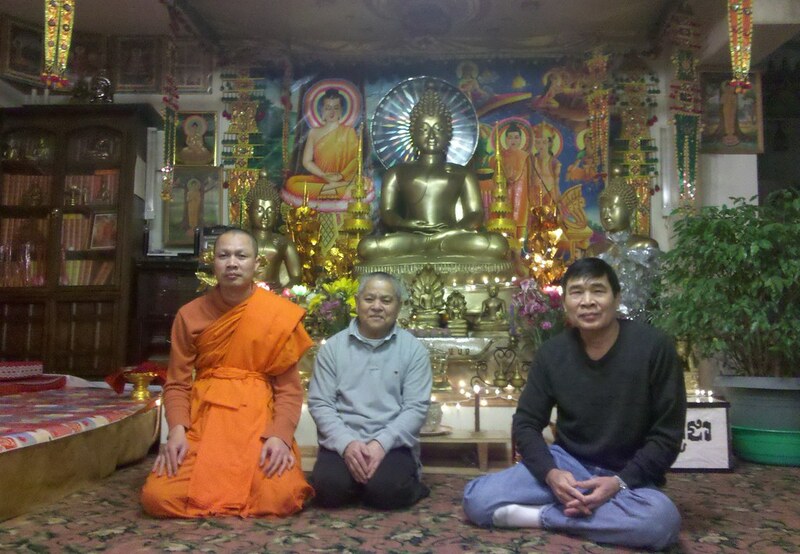 This is one of two Cambodian Buddhist temples in NYC, the other being Wat Jotanaram in the Bronx. I was surprised to find this temple sitting at the end of a block of large Victorian houses; in fact, the temple itself resides in one of those houses. Take a look! The two gentlemen on the right were standing outside when I passed by. We struck up a halting conversation built on their modest English and my nonexistent Khmer. They invited me inside to see the sanctuary and meet the temple's monk (the gentleman on the left, in case you couldn't tell). Before I knew it, the conversation had turned toward my singlehood; the idea of fixing me up with a Cambodian girl was proposed and roundly lauded by my new friends. However, before I had a chance to unwittingly and irrevocably signal my matrimonial intentions with an absentminded gesture, like in some bad movie, the clock struck four: it was time to pray. For the next forty-five minutes, the five of us (there was one older woman, as well) sat on the floor in the same asymmetrical pose that the fellow on the right is holding in this picture (occasionally switching legs), with hands raised, palm-to-palm, at chest level. My companions sang what was essentially one continuous chant, which sounded something like this. Even for a total outsider, it was quite entrancing at times. Before I left, they invited me to attend their three-day-long Khmer New Year's celebration in April. As it happens, I will be out of town for those very same three days. But hey, there's always next year — and I'll still be walking then, after all! awesome. And I think a Cambodian girl would be perfect for you!